In all the crannies and all the nooks." I'm a writer. Not a known one, not a published one. Just a girl who likes to write. Therefore, being surrounded by piles of books is a necessity. I mean, books are special. They just are. My great aunt Mary Jim instilled a deep love and appreciation for books in me at a young age when she began buying fancy leather-bound classics for each birthday. And as a wee homeschooler, I practically lived at the local library; my mom took my sister and me there at least once a week for Story Time. But as much as I loved Story Time, I loved the time before and after it even more. That was my free time. My adventure time. There was something magical about exploring the seemingly endless maze of books towering above me. They captivated me. I would pull them at random from the shelves and plop down onto the outdated, moldy carpet, cautiously and respectfully flipping through the pages, losing myself in tales of the Loch Ness Monster, space exploration, ancient Egypt, and Jeffrey and his thirteen ghostly friends. I get all warm and tingly remembering those special library floor sessions. I just love books. I love them. I'm the kind of weirdo who has to inhale the scent of a book before I start reading. Really. I like to walk into a Barnes and Noble and just sniff. So. 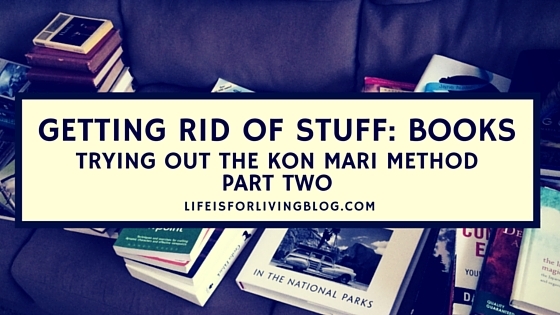 You can see why step two of the Kon Mari method was so difficult for me. Step two is sorting and discarding books. It begins just like step one did with clothing: you go through the entire house, gathering every single book in the place, and pile all of them together on the floor. Then you go through and decide which ones to keep and which ones to discard. Well. Finding them all was easier said than done. Books are errywhere. On the bookshelves. On our horribly unorganized desks. And of course, on the back of the toilet. Oh, and I almost forgot- in four giant Rubbermaid totes in the basement, because there aren't enough shelves to put them on until the proposal TARDIS bookcase is finished. Yeah, the TARDIS looks like this right now. It's so sad. A broken TARDIS. And all my favorite books, imprisoned in the basement. Anyway. I got to sorting. And I realized that I have a problem. Well, more problems than just book hoarding. A good 45% of my books were things that I'm holding onto for future children. And this is beyond Amelia Bedelia, Anne of Green Gables, and my Harry Potter and the Sorcerer's Stone pop-up book (YES, there's a pop-up book for younger kids!!!). That's the normal stuff. I'm talking about that old English literature anthology that I might use in a 10th grade homeschool English class. Or that book about the lost colony of Roanoke that would be a helpful supplement for a homeschool history lesson. Even though I hope and pray that I can someday homeschool my children, their 10th grade year is a LONG time from right now. There is absolutely no need for this kind of stuff to be taking up space in our little place in 2016, and there is no need to haul around all these heavy textbooks for "someday" with every move we make between now and then. So I got rid of them. And I confess, it did hurt a bit. I couldn't help but feel like I was throwing out my dreams for the future. But I wasn't, and it'll be okay. Then there were all the books I bought on clearance without having read them first. You know, an intriguing-sounding paranormal novel from an author I've never heard of. It was only $2.99, but it turned out to be a flop, and I stopped reading halfway in because of the crappy writing. But after having such a "meh" reaction, did I send that book on its way? Nope. Not until now! I grabbed an empty Rubbermaid tote and began filling it with titles like this to take to Hastings for buyback. Lastly, there were all the other books I bought without having read them first. Books I still haven't read, but will read "someday." You know those books. I had probably twenty or more of these unread volumes, and most of them didn't even sound appealing to me any more. So guess what? They went in the Hastings tote, too. And you know what? I felt better. Because without those books staring me down every time I walked past them, I was free of their subtle oppression. No more of the stressful, "Ugh, I still haven't read that stupid book! Why do I even have it? Dang it, I have to make more free time!" By the end of it all, I had filled TWO Rubbermaid totes and a large reusable shopping bag. There were so many discarded books that we politely called Hastings ahead of time to let them know we were bringing in an extra large buyback. I'd love to say that money went straight to our debt snowball, but we were so tired and hungry from all that Kon Mari-ing that we went out for Mexican. Having pared my books down to the minimum, I now treasure my Harry Potter collection even more. The Hitchhiker's Guide to the Galaxy and Jane Eyre are even more special to me. I'm getting the Kon Mari fever. Oooh, with clothes and books done, I'm ready to tackle the rest of the house. I am going through this exact thing right now too and found homeschool textbooks for our future children haha!!! I had to keep them!